It all started with a Lounge article on the Hay-on-Wye festival in the UK. “I was intrigued by the idea of a festival like this and asked Jo (Williams), a regular customer at our store (also a former organizer of the Red House Children’s Book Award in the UK), to explain the concept. 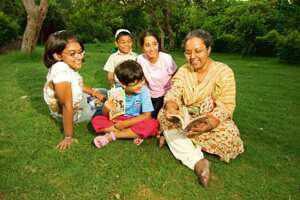 As my partner and I heard more about it, we wanted to do something on the same lines but for children," says Swati Roy, co-owner, Eureka Children’s Bookstore, New Delhi, publisher of Heek, a magazine for children, and one of the organizers of the Bookaroo Children’s Literature Festival 2008. The festival, which will be held over two days at Sanskriti, Anand Gram, Mehrauli-Gurgoan Road, is not restricted to just book readings or interactions with authors. “A good literature festival for children usually offers a wonderful day out for child and adult alike. And because it is all about books, it can help to encourage the reading habit," explains Williams, who has in the past been associated with children’s events in the UK. She says it is a conscious decision on the part of all the organizers at Bookaroo to put together a series of activities so that “children are excited by books and get interested in them". From plays and poetry sessions, workshops with illustrators and graphic artists, a session by Wendy Cooling (author and international book consultant), who will share tips on how to get children to read early, to Stephen Guy’s automata (self-operating machines) workshop with Gond artist Bhajju Shyam, the festival aims to provide a mix of activities centred around books. At least 30 authors and artists from Delhi, Mumbai, Chennai, Australia, the UK and US have been roped in for the festival. The sessions have been divided age-wise (children as young as four can participate). “Since our aim (is) to present books and reading as a fun activity and not as a chore, we are keen that this festival be more of (a) family event rather than schools booking slots for the sessions," explains Swati. Apart from workshops, there is a graffiti wall and bookmark-making session in which anyone can participate. Though entry to the festival is free, only those children who are pre-registered can participate in workshops. Ahead of the festival, an outreach programme, Bookaroo in the City, has been organized in conjunction with the NGO, Pratham Delhi. Book-related events for under-priviliged children in schools across NCR will be organised on 19 and 20 November, such as story telling sessions by Rukmini Banerji and Smita Vats and Bulbul Sharma’s art workshop. The organizers hope that the festival will be able to travel to Mumbai in February during the Kala Ghoda Arts Festival. 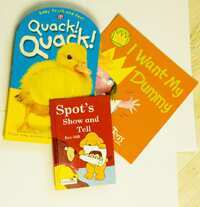 • Choose books rich in rhyme and rhythm that will be a joy to read aloud. • Reading time is all about sharing. Don’t expect reading time to be quiet time—encourage your baby to try and gurgle along with the words even before she can speak, point to pictures as you read about them and encourage your child to join in with the page-turning as soon as you can. • It is essential for children to hear stories in their mother tongue. It helps them to love and celebrate their local language as well as others they may need to learn as they grow up.